Hey friends! I hope all of you had a wonderful weekend celebrating Mom's Day! Our was pretty low key, splitting the day between both families and eating lots of yummy food! And even though I was feeling under the weather, it was nice to spend the day with our Mom's! 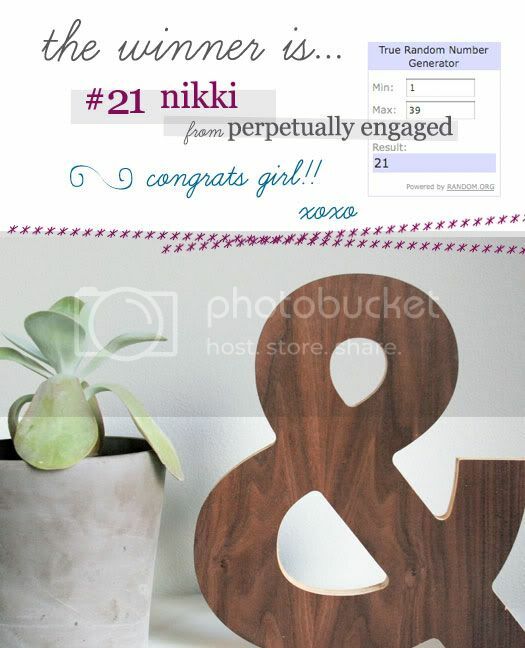 Congrats Nikki! Thanks to all those who entered and thanks to Edie's Lab for offering such an amazing giveaway!! oh very cool! Congrats nikki! Whoo hoo! That was a very exciting email to get this morning. Thanks so much Jessica! Congrats to the winner! That "&" is so rad! thank you Jessica for the great giveaway and marketing opportunity! we've enjoyed working with you!! congrats nikki on winning the ampersand! all typography lovers, check out our etsy shop anytime. we are working on some new and really cool designs, so check back in a couple weeks.